When I saw the trailer of this film, I know I have to watch it. Hello? It's a Vilma Santos movie. You just have to watch a Vilma Santos movie diba?!! It's hilarious. It's heart-wrenching. It was really really good. As we all know para syang Devil Wears Prada na may cancer factor na may mother-child issues involved. I cried dun sa scene ni Angel at Vilma as they talk about their struggles. One from a mother's point of view and the other from the child's. While watching the film, naisip ko talaga na hindi worth it ang trabaho. You should really give your time to your child kasi dadalhin nila yun paglaki. Then on our way home napanood ko pa yung video ng manulife about OFW and their kids. Ugh! I also feel for Angel. Panganay din ako. I know how difficult it is to bear the weight of your entire family just because panganay ka. You have to be strong. Wala akong masabi kay Vilma at Angel. Iba sila pareho eh. 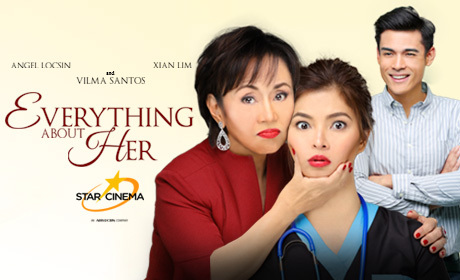 And although Xian Lim is waaaaaaaaaaay far behind the two ladies, I could say that Joyce Bernal was able to direct him well. Medyo, as medyo lang naman hindi ako nag cringe. Ang tanong ko lang sa Star Cinema, bakit ba hindi na lang sa iba binigay yung role? Hihihihi! Overall, it was a feel good movie pero may substance. Maganda sya because it's light but still may kurot sa puso.